Since it is a new year, I have decided to do a quick guide to starting a blog. It's a great time to start one, if you haven't already. 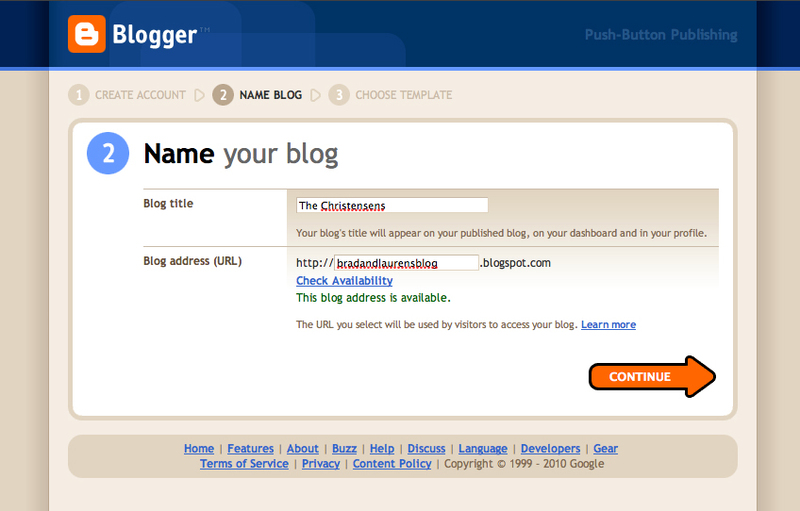 If you do have a blog already, make sure you are updated to the latest features! 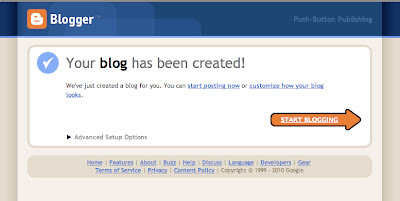 See the steps listed at the bottom of this post after step 6 to learn how to update your blog. If you are just starting a blog, you will automatically be making your blog with the newest features, and there is no need to upgrade. One fun thing to do with your blog (especially a family blog), is to compile it into an actual bound book of blog posts for the whole year. There are a number of places to do this: Blurb, Bookemon, Blog2Print, and more. I was recently talking to one of my friends who told me that she loves to look at others' blogs, but has no idea how to do her own. So for those of you like my friend, here we go! With my post this week, you will be able to create a blog, and make a blog post. Stay tuned for my next Monday's post that will help you understand a few more features available to you. 1. When you view a blogger blog like ours, you will notice that up in the navigation bar, there is a spot that says "Create Blog". Click on that. ***After you have completed all of these steps and made your own blog, you can always click on the "Sign In" option in this same area where you will be able to sign in and access to edit your own blog. 2. It will take you to a page that you can fill out to get started. 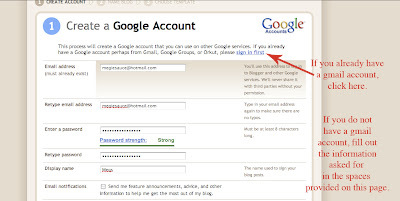 If you already have a gmail account, you don't need to fill anything out here--just go ahead and sign in with the sign in link on the page, then fill out the information it asks for. 3. After you have created your account, you will want to name your blog. You can change the name of your blog whenever you want throughout your blogging experience, but changing your blog address (URL) isn't as easy. Pick an address that resembles what you want to blog about. If you click on "Check Availability" Blogger will let you know if the address you have picked is available. When you've got the address you want, go ahead and click on "Continue". 4. The next step is to choose your template. Go ahead and pick one that you like. 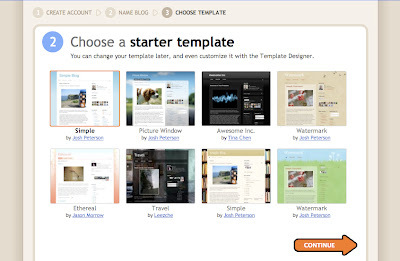 The biggest difference in the templates is how they look, but if you want to get things more personalized and custom, then this won't make too much of a difference. 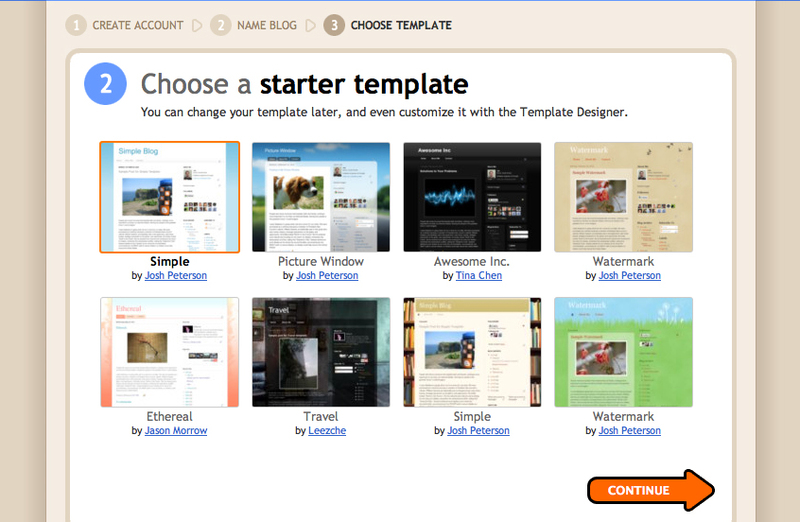 My most recent blogs have been based on the "Simple Template", but you can pick whatever you want. 5. After you've picked a template and click on "Continue"---your blog is live at the address(URL) you've selected and you can go ahead and click on "Start Blogging"! This is the page where you will make each post. Here is a quick guide to the buttons and features you can use on this page. While editing you can select any text throughout your post and add certain features to that text by using many of these different options. You can also click and on pictures that you have added to your post and apply these features to them as well. 11. Make text into a link. Select the text you want to be a link then click here to choose where it will link to. You can also select images and make them into links. 12. Add an image. On the left you will see that you can select to upload an image from your computer, your blog, Picassa Web Albums, or a URL of an image you found. While one is uploading, you can go ahead and select more images from your computer by clicking on "Choose File"--as many as you like. The images will show up in the box when they are uploaded. 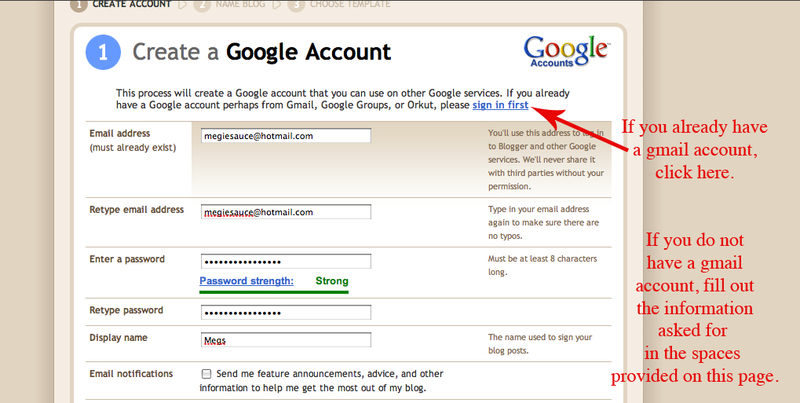 Blogger just made this option so much more convenient! If you accidently delete a picture after you've inserted it onto your post, you can just go back to this option and your image will still be there to reselect. Also, after you insert your images, you can control the size of each image as well. Just click on your image and you will see the options that you can click on that appear below your image. Your blog must be updated for some of these picture options. 13. Add a video (you can insert a movie to upload from your computer, YouTube, your own YouTube videos). 18. Add a quote (this will separate the text you've selected from your paragraph and center it). 21. If you click on "Post Options" some options will appear that will allow you to decide whether or not you want to allow viewers to comment on your post, customize some HTML options (you probably won't mess too much with this), and schedule your post to go live at a specific time. I love this last option because especially with this blog, I can make multiple posts and schedule them for the day that I am assigned to post on. After you are done with your post, but don't quite want it live yet, you can schedule your post and then hit publish post. It will save and tell you when your post will go live. 23. Click "Save Now" periodically to save your post as you create it. If you don't finish your post right away, this saved post can be edited later. 24. 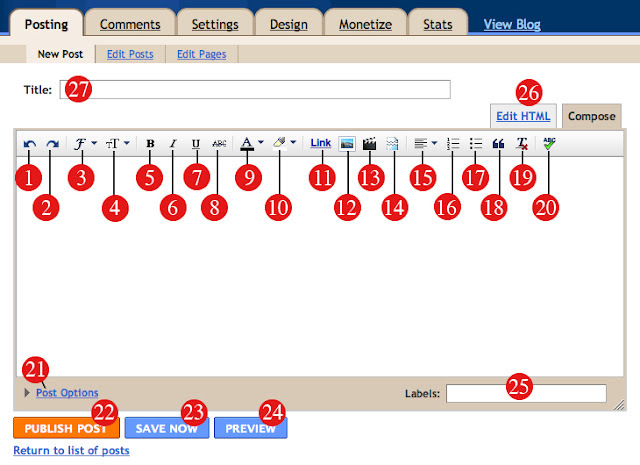 Click "Preview" to see how your post will look on your blog without publishing it yet. 25. Here you can enter in labels that your post fits under such as "Summer", "Crafts", "Christmas", etc. This way you can create groups of posts that fit under certain labels. 26. Here is where you can access the HTML code of your post. You can insert any HTML code here that you might grab from any other site for a button, etc. If you click back to the "Compose" tab (Right next the the "Edit HTML" tab) after you have entered your code in under the "Edit HTML" tab, you will see how the code you pasted in is interpreted to show up on your blog. Most likely you won't have to use this too often if you consider yourself a beginner blogger. 27. Insert what you want your post to be titled. 6. 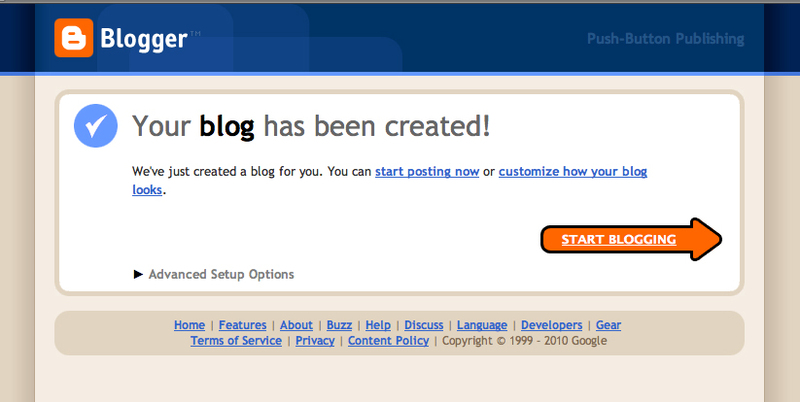 After you have entered your post, you can go ahead and click on"Publish Post" and then view your blog. You will see your post live on your own new blog URL! ***If you are already a blogger but don't see some of the features listed here on your editing options, it's time to update your blog! Blogger just gave us new features ! I just have to tell you that I think you are AWESOME! I am very new to blogging and your posts on 'how to' are fantastic. Thank you so much! I can personally attest to the sheer awesomeness of a printed blog!!! I use Blurb every year and have yet to be disappointed. It's such a great way to archive photos/stories/etc. Plus, it's saved on the Internet so that (Heaven forbid) if a flood or fire completely destroy all scrapbooks, journals, photos, other blog books, etc., all you have to do is order another one.